Early next week I am heading off on a long vacation in Indonesia, before going my goal is to finish the rims. 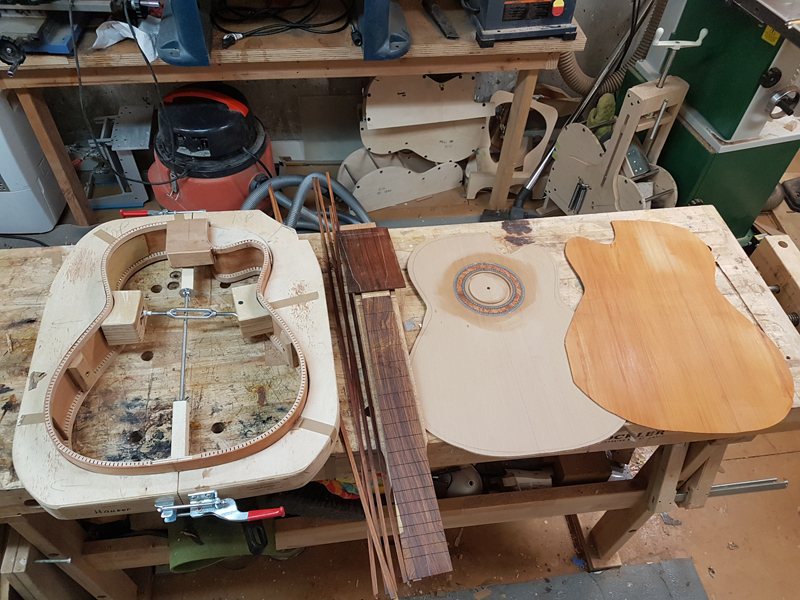 I will wait to brace the top and back as I do not like having braced back and sides lying around. I would rather get them in the rims within a week of bracing. I made good progress yesterday and today. 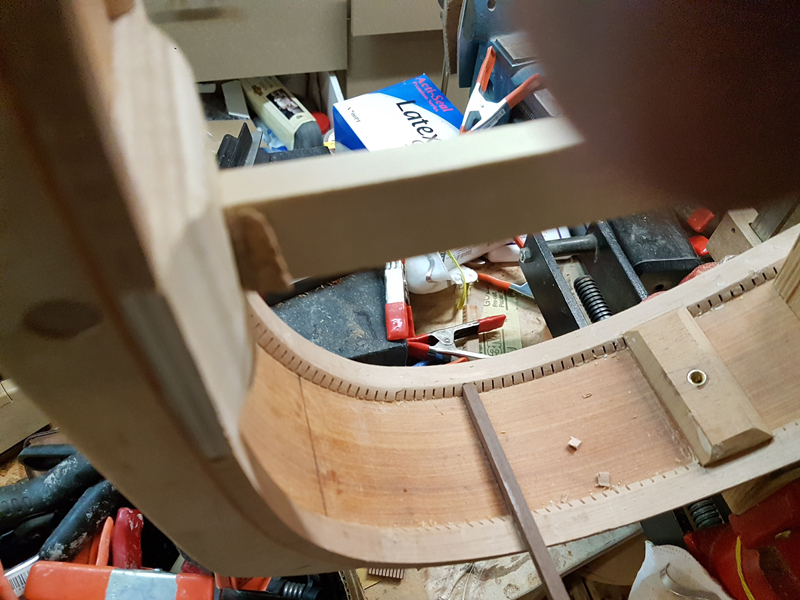 First off I cut the excess form the sides. 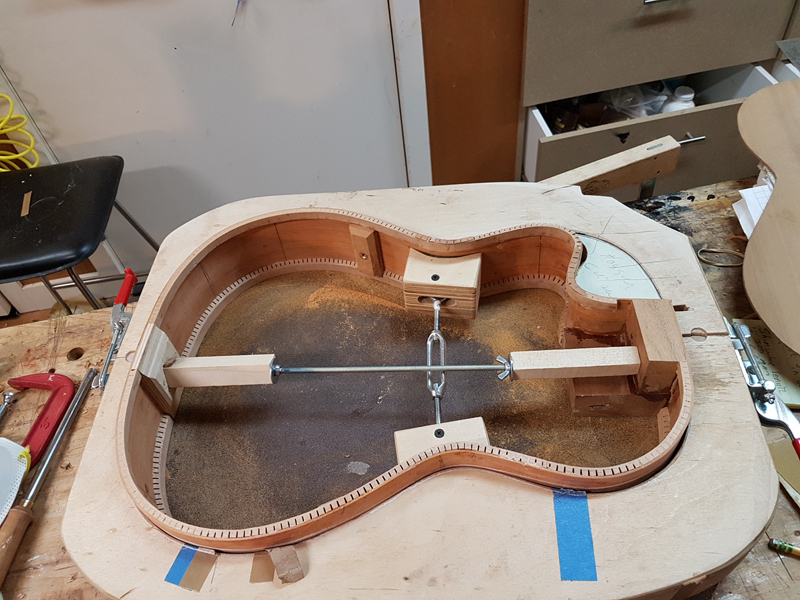 and properly fit the sides into the mold. 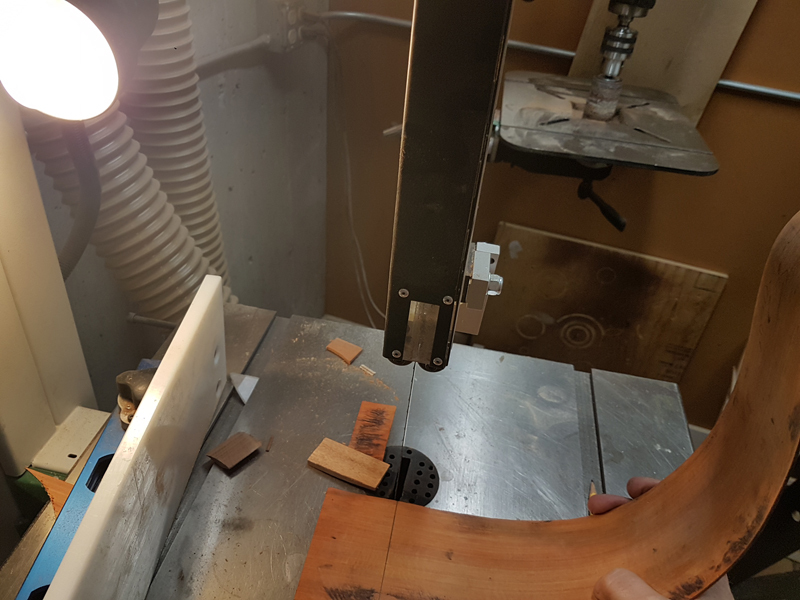 With the side properly in the mold I mark the center line, use a machinist square to draw a line on the outside and to transfer the line to inside allowing me to cut to the line on my band saw. 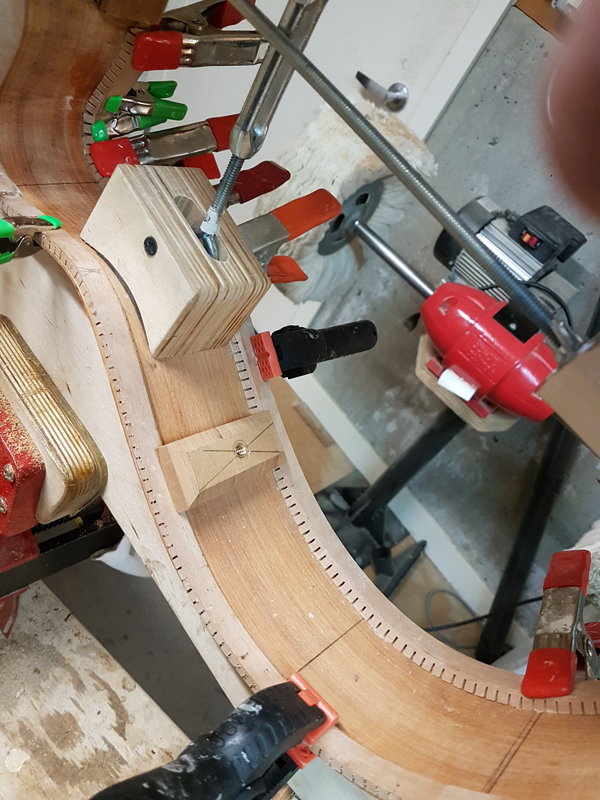 I find tune on my belt sander also assuring that it is square to the top. 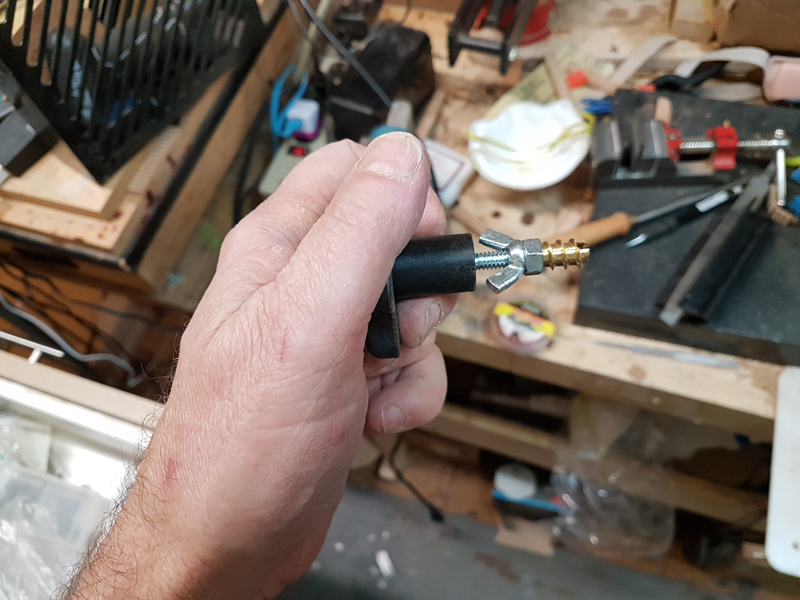 I use that side to mark the second side, not show but again I use a machinist square to draw a line on the outside and to transfer the line to inside. 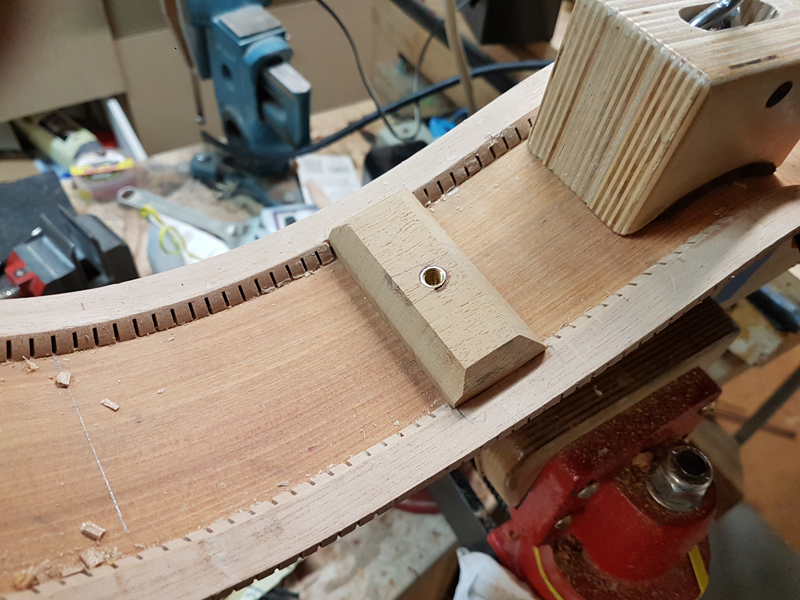 I cut on the bandsaw and fine tune to a perfect fit on the belt sander. 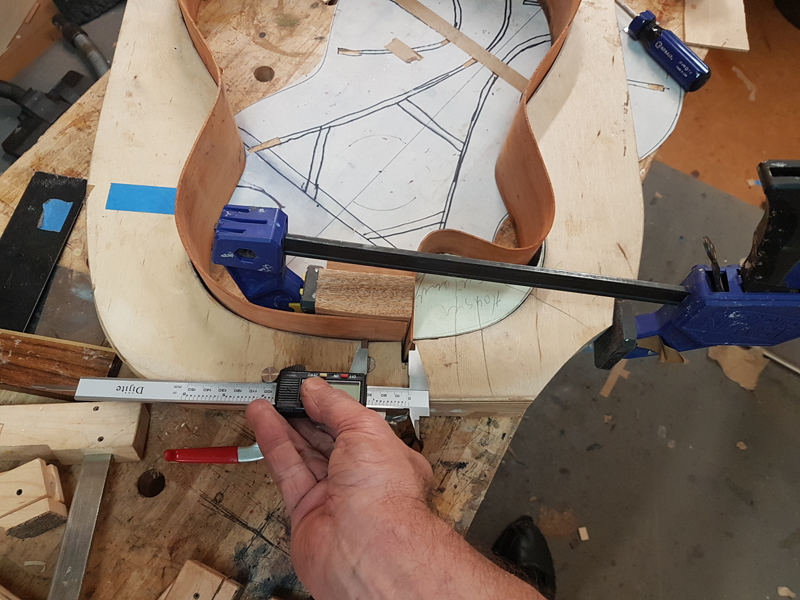 The cutaway side basically needs to be perfect to match the fretboard width at the 12th fret. 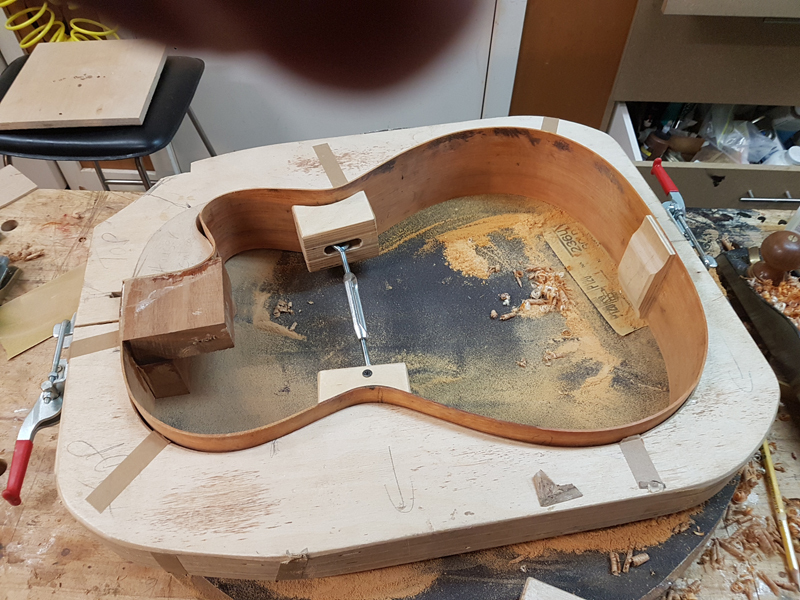 I checked a few times and ultimately made a fine adjustment to the cutaway inset in my mold. 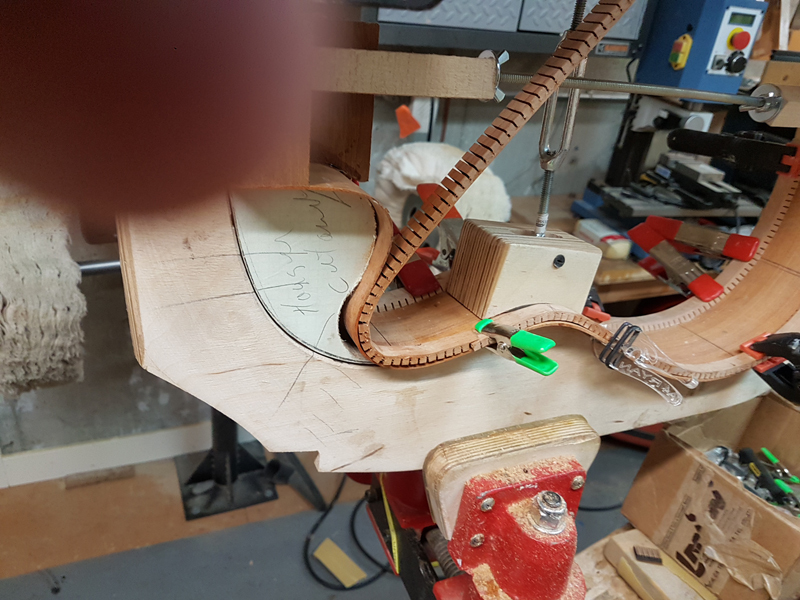 I will end up pulling the heel block and the cutaway side to the insert when gluing just like what is shown in the picture. 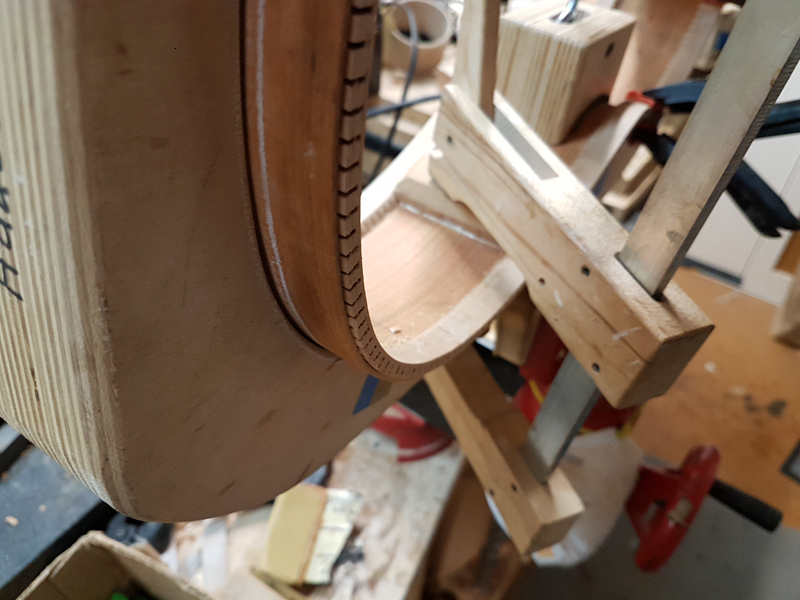 I also did a test run to see if I could clamp the heel block in some semblance of alignment and then glued it in place. 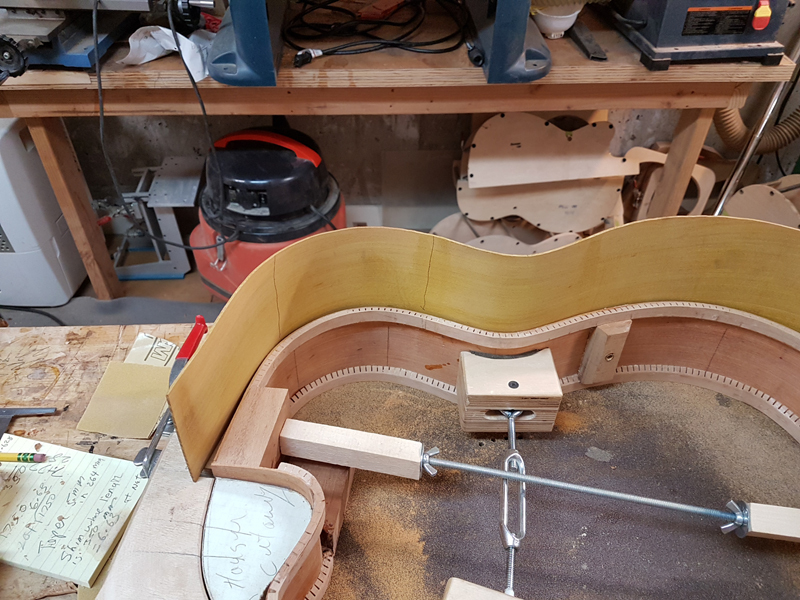 I use plywood for the tail block and thin the top and back side so that it is the same thickness as the linings. 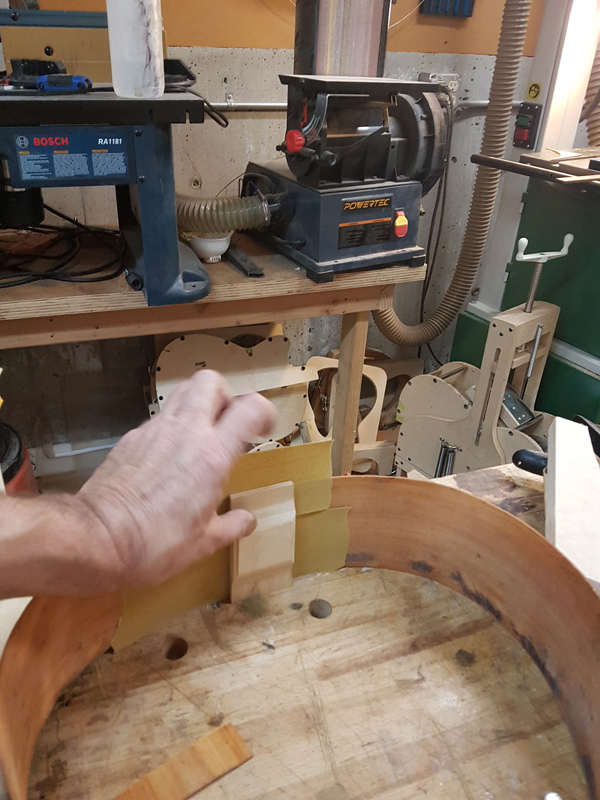 I use the sides in the molds to radius the gluing surface. I turn it over a bunch of times to evenly sand it as the mold only supports half of the side. Then I glued it into place. 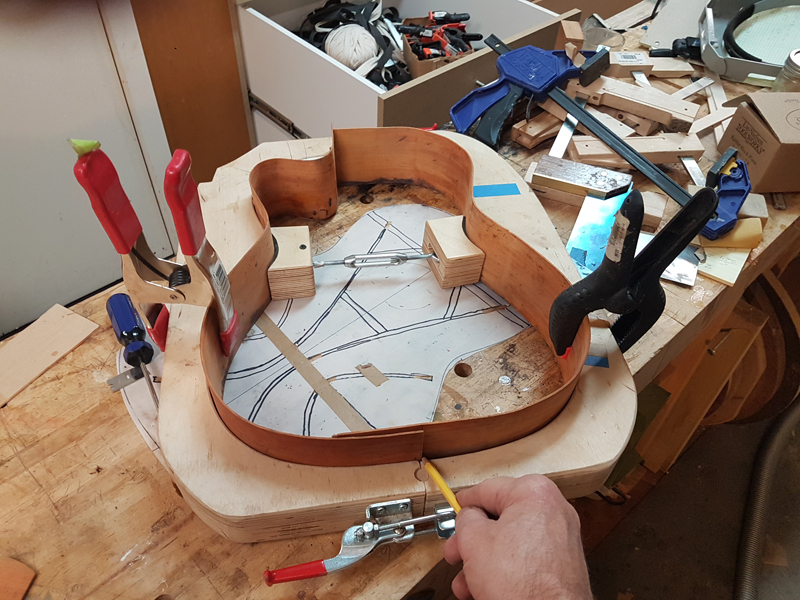 At this point I use the mold as a template and indexing off of the top of the sides I draw a couple of parallel lines before I profile the sides. 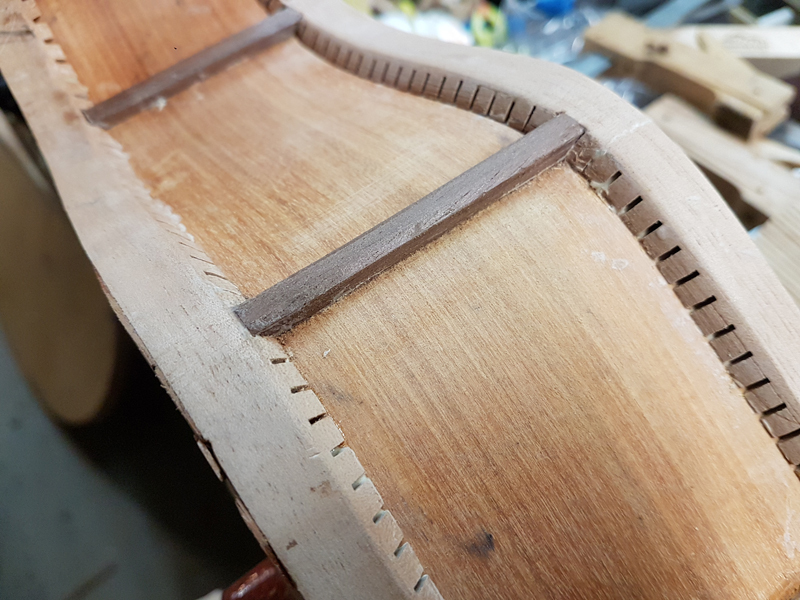 These line assure that I can get the rims back into the mold at the original alignment, I have two lines so I can leave more room on the top of back side as needed. I am using a 32' radius dish for the top and a 10' dish for the back. 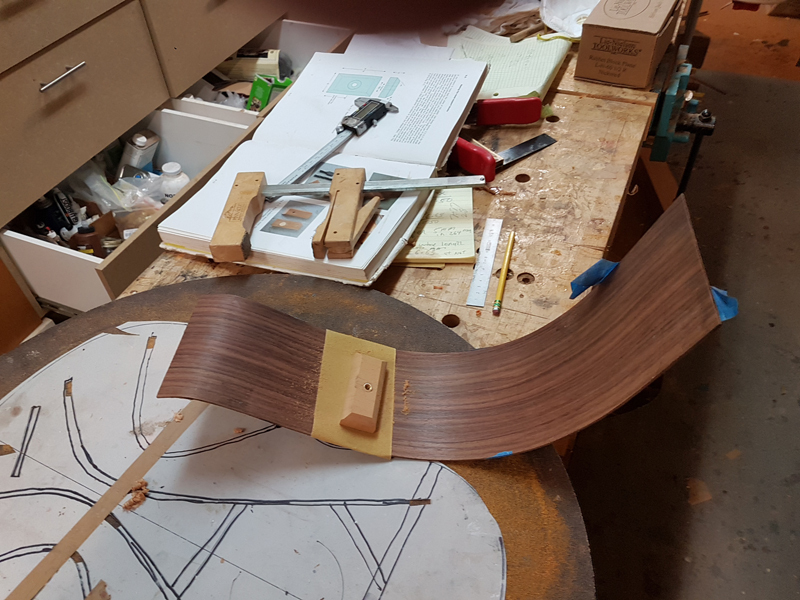 I use a combination of planes and the radius dish to get the rims correctly profiled to the right size. I did not do much on the top's upper bout. 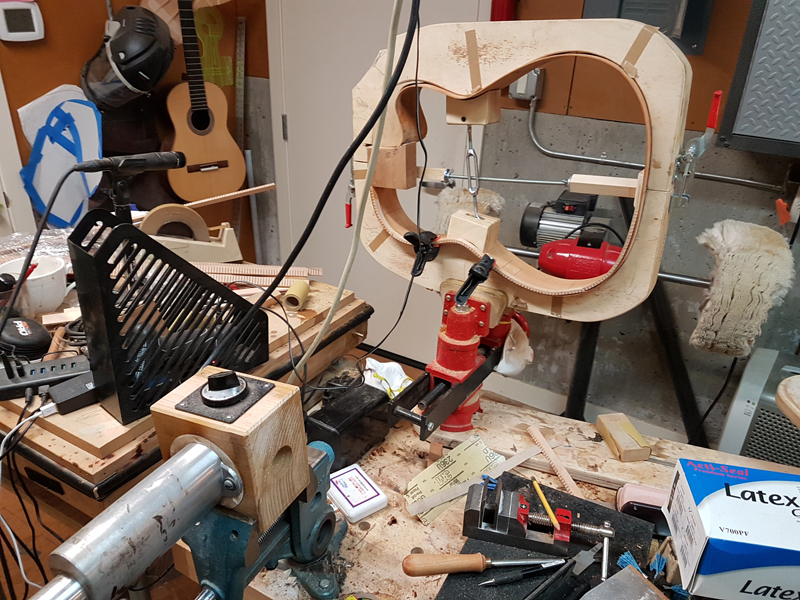 I mostly radius the lower bout of the top. 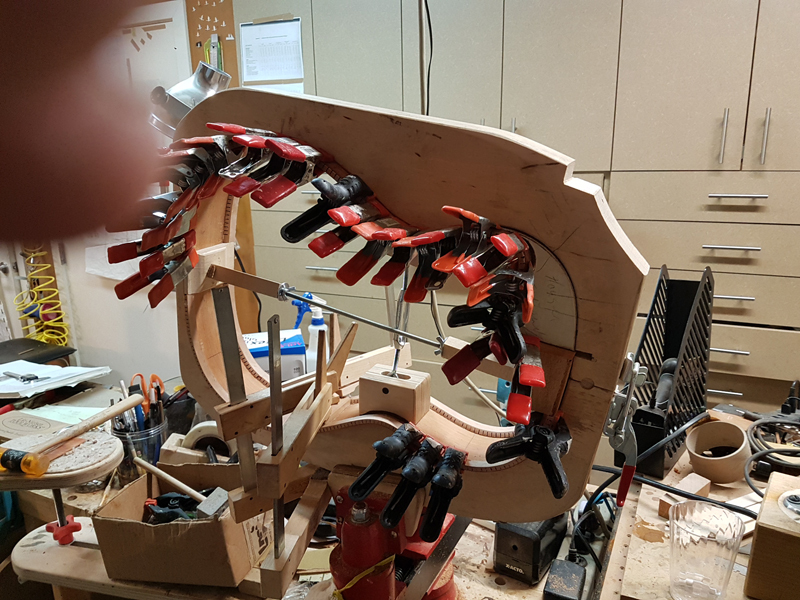 Ultimately when I have a braced top I will finish the upper bout top to support the correct neck angle. 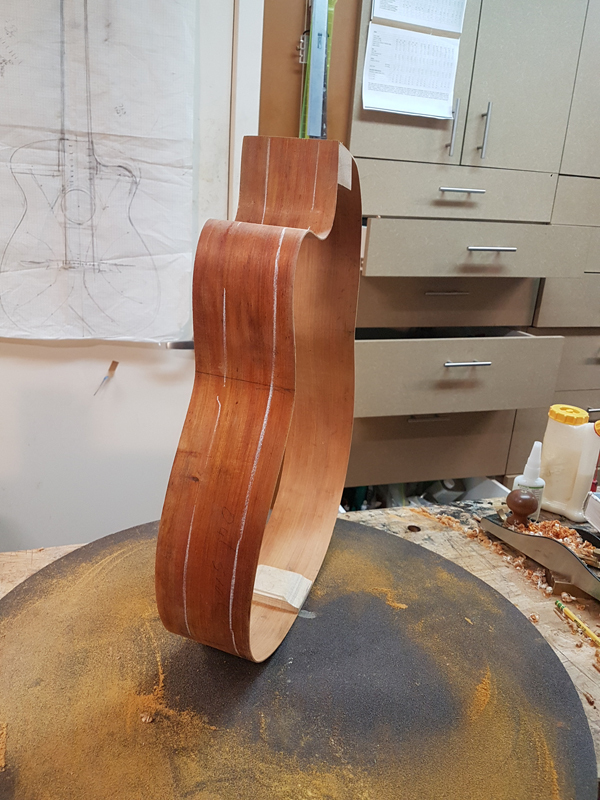 It did not take long to profile the sides as they were cut pretty close. 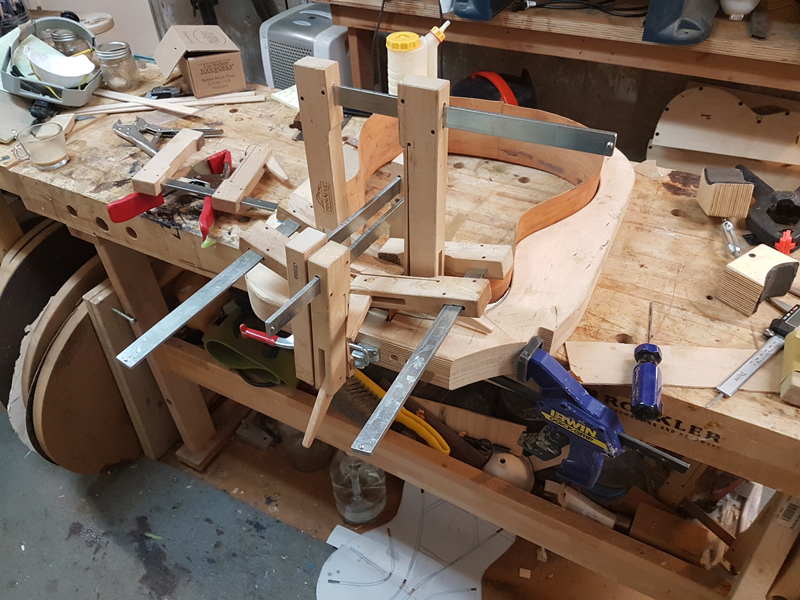 So with the waist and the blocks clamped in to place I prepared to put in the linings. I am going to use revered kerfed linings. 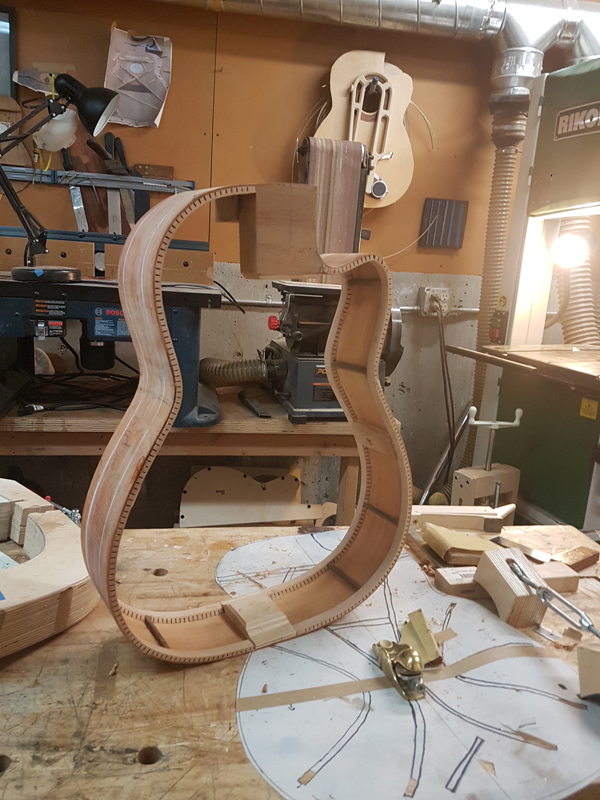 As they will break around the cutaway curves I decided to use my bending iron to prepend the curves. 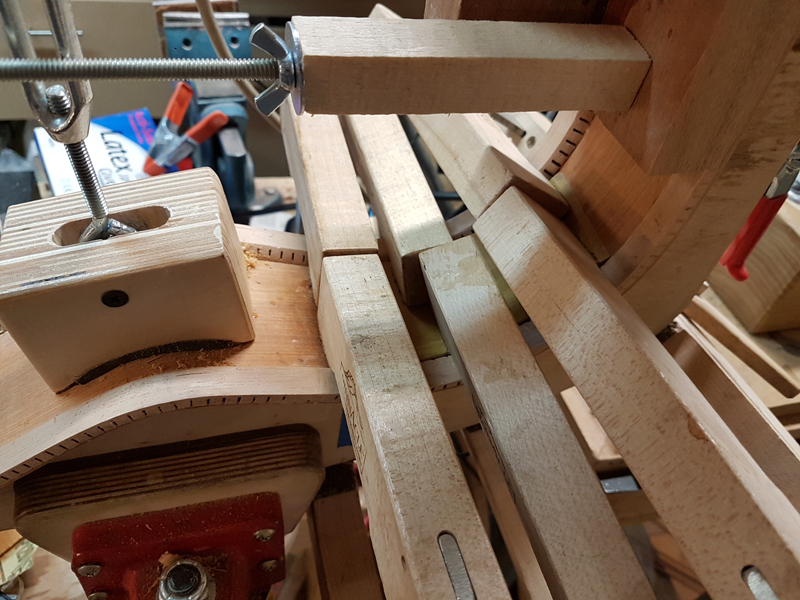 I would just bend test and glue and it went ok. A couple of breaks but no big deal. 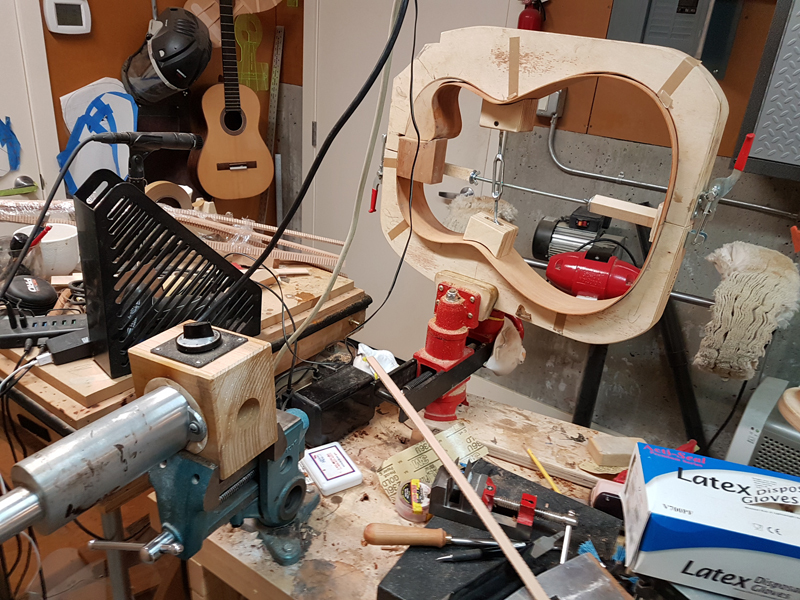 While waiting for the glue to cure, I only have enough clamps for one side, I made a couple of mass mounts so that the guitar can be tuned with side mass. It is pretty simple. 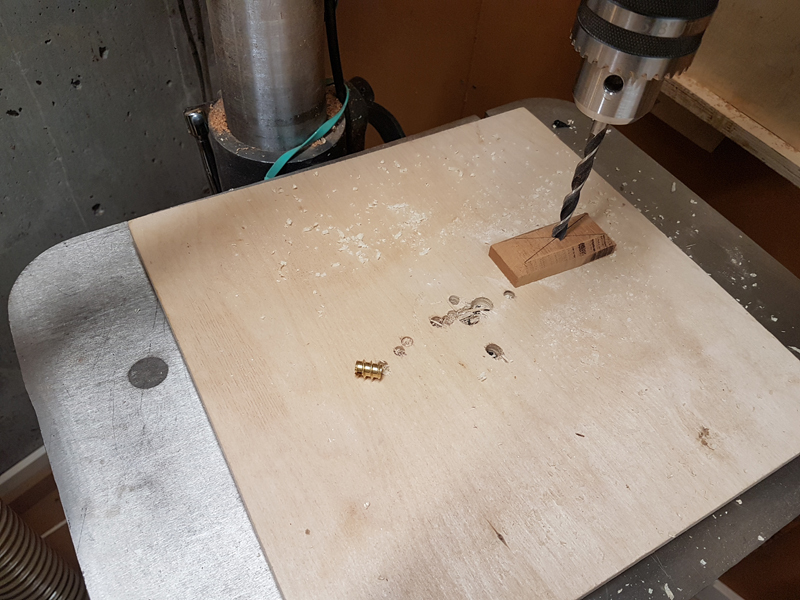 Using the drill press for the brass insert keeps them straight. and I use my fancy home built installation tool. 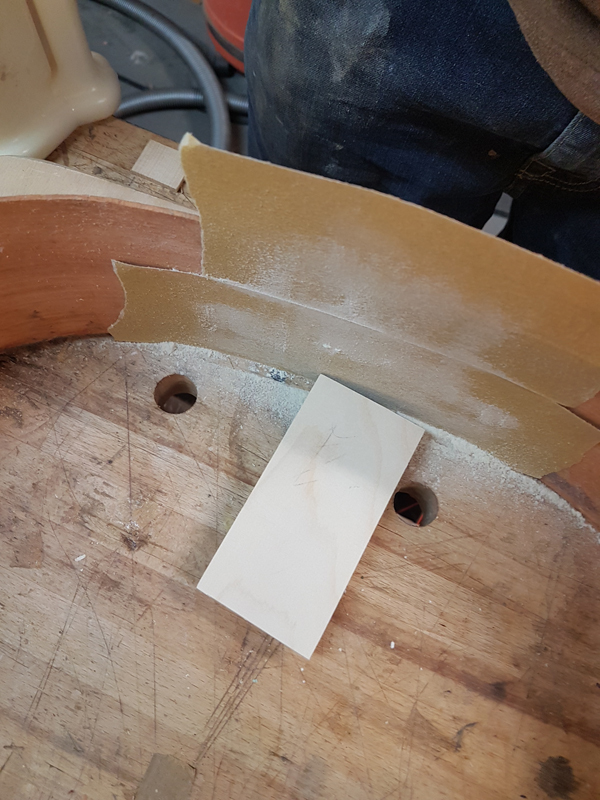 I remembered I had an orphan bend side that I have been stealing bits from and realized it was perfect for sanding the gluing surface of the mass block. vI inlet them into the linings and glued them in place. Just waiting for everything to cure and I can put in the side reinforcements. I was able to get in one more day before my vacation and have the rims in pretty good shape. 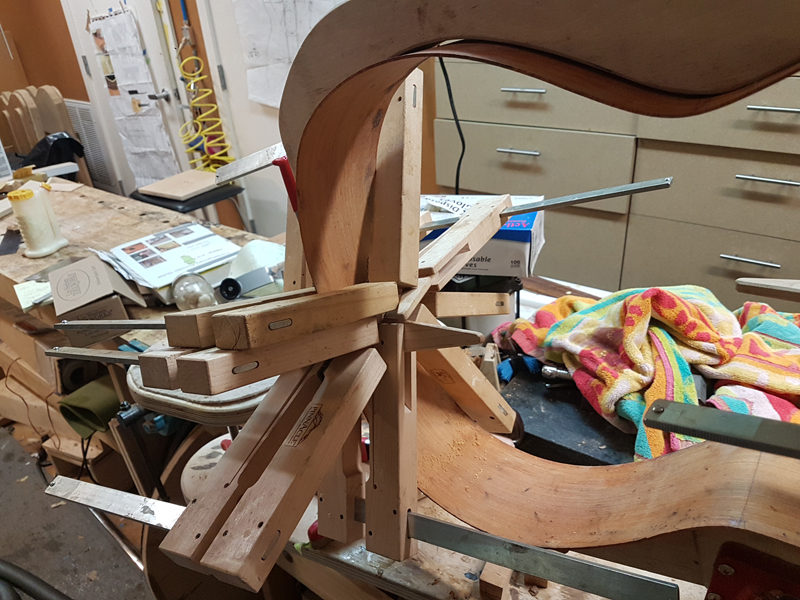 I installed the side struts, and profiled the linings on the radius boards. Here is how I got there and what I have so far. 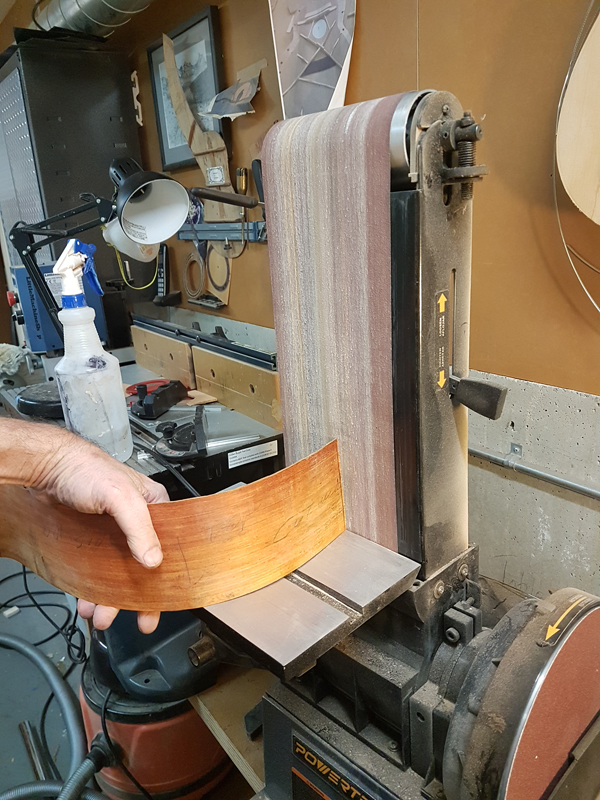 I installed the linings slightly tall so I first planed and then sanded them back in the radius dish. As before I completely radiused the back but The top is radiused from the lower bout to just past waist. The angle of a top sitting on the rims is very close to the angle I am looking for. 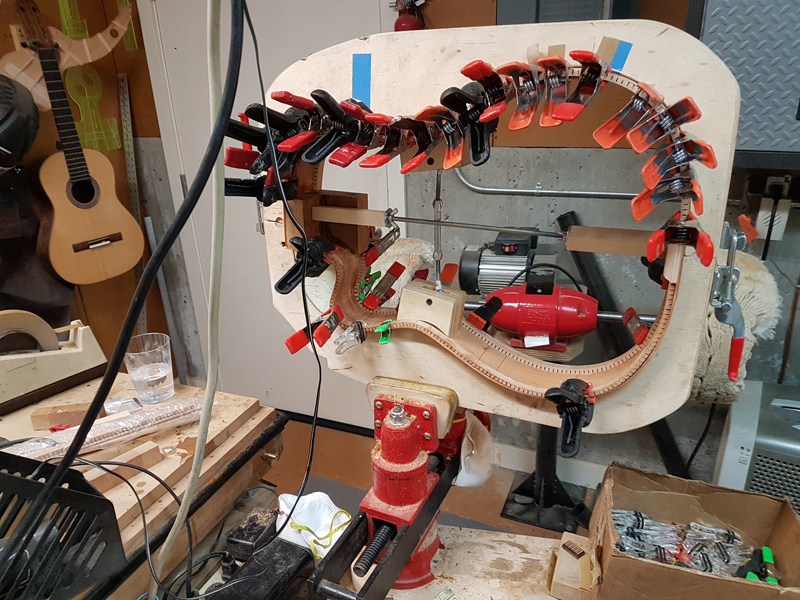 I will fine tune when I have a braced top I can test by running a straight edge along where the fretboard extension will sit and testing the height at the saddle location. 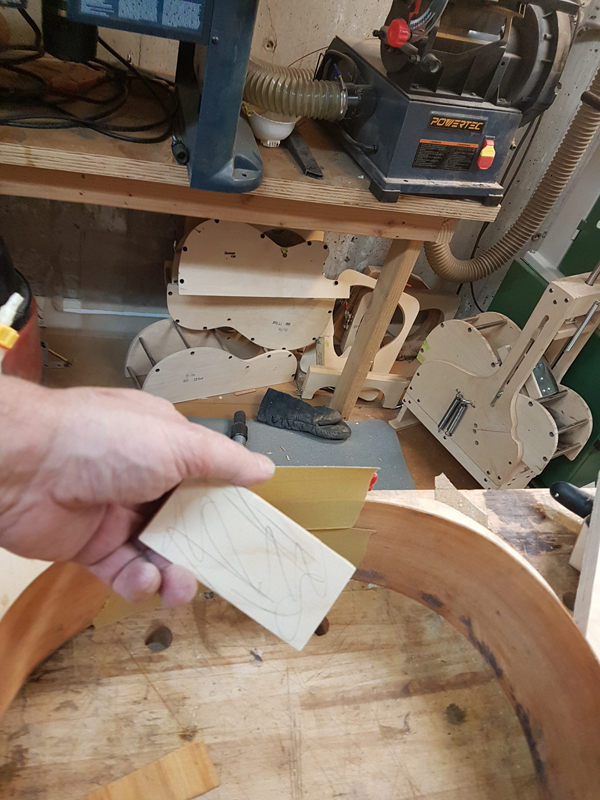 There has been discussion with the client about a sound port so in preparation I reinforced the area where I would install a sound port, with a portion of an Osage Orange side that I burnt with a defective heat blanket. (A small area char but completely through.) I threw it on a shelf for just such an opportunity. I installed some side strut using some wood that was used in shipping to keep a bunch kerfed linings safe. 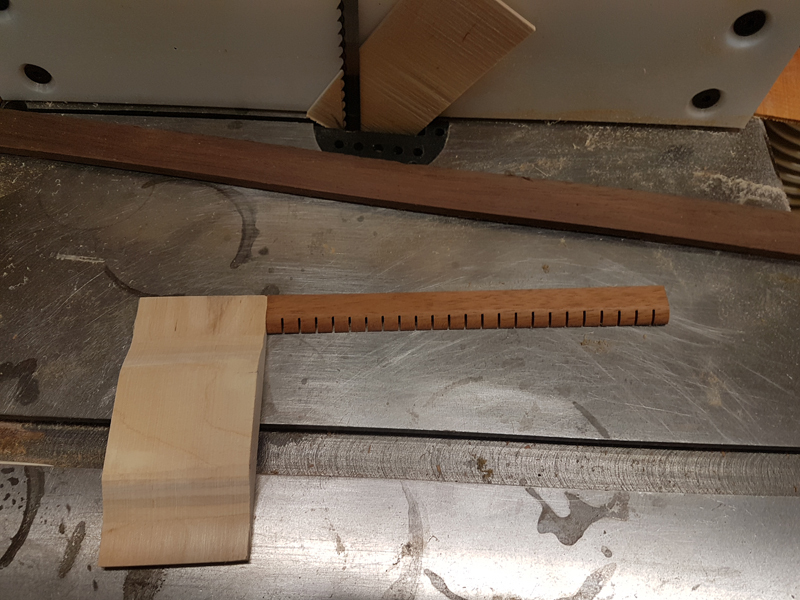 It was 6 mm thick and I ripped a strip that was just wide so that I could cut out a single kerfed tab with a 1/4 chisel. It was the fastest I have been able to install the struts and it made for a clean install with the strut basically the thickness of the linings and fitting in a clean rebate. So with all of that I started to clean up the glue and the like and I will be ready to go on after vacation.